Every so often, you visit a destination that steals your heart and makes you rhapsodise about it to everyone you know for months afterwards. Boarding my morning flight to Estonia’s capital city, surrounded by stag parties shooting miniature spirits and drinking the airport dry of Becks, I wasn’t sure whether Estonia’s capital city and I would get along. But, as I quickly found, there are two types of Tallinn; the one that appeals to lads on tour looking for a dirt cheap weekend, and the one that’s quietly asserting itself as one of Europe’s most exciting gastronomical cities – thanks to a new generation of fusion restaurants, speakeasy cocktail bars and Scandi-inspired brunch spots that are popping up at a rapid rate. While bachelors tend to roam the bars around the Town Hall Square and the cruise ship crowd tour the city’s UNSECO-protected Old Town, it’s the outskirts of the medieval defensive walls that are getting trendy. Most notably, the hipsters have Kalamaja – a former working-class suburb that’s been transformed with craft beer bars, fika cafes and art galleries. It’s here you’ll find Telliskivi Creative City – a former industrial area that’s become a beacon for Tallinn’s new vibe. Decaying warehouses have been coated in street art and converted into studios, design shops and gig venues, attracting a young crowd of artists and tech entrepreneurs (the city has more start-ups per person than anywhere else in Europe). Scratch the surface and you’ll find more of the same creative energy in pockets of the centre. Smart Finns have been hopping on the boat over from Helsinki to gorge on Estonian food for years, but a smattering of new openings are breathing new life into Tallinn, with acclaimed chefs like German Michelin-starred Matthias Diether setting up shop on Estonian turf, alongside a younger generation of up-and-coming cooks. It’s cross-cultural geographical location makes it a melting pot of foodie influences – most notably Baltic, Nordic, and Russian – so plates are often as diverse as they are delicious, serving up everything from meat-filled dumplings and fermented foraged vegetables, to fresh and zesty pickled fish. Mixing light with heavy, raw with comfort, it’s a new type of cooking style that puts an Estonian twist on the ‘new Nordic’. Thanks to minimal bombing in World War II, Talllinn also has one of the best preserved Hanseatic town centres in the world. Unlike the grit of Berlin or the seedy underbelly of Amsterdam, navigating its streets is a living fairy tale; all pastel cobbled lanes, medieval turrets and nooks to steal away in. 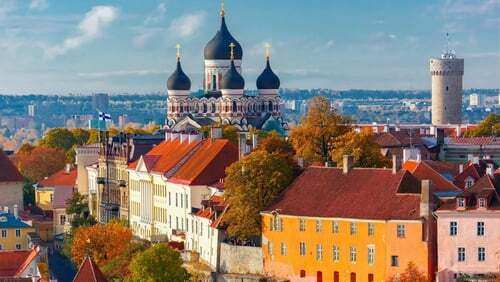 Since Lonely Planet named Tallinn its best value destination of 2018, more people have been flocking here, and so prices are slowly going up – but you still get a lot of value for each euro you spend. The cost of a pint is around €4, while a three-course meal for two will set you back around €40. If you’re staying in the Old Town, ORE (orerestoran.ee) is a proper introduction to the very best of fusion Baltic cuisine. Dishes change regularly depending on the season, but we devoured an excellent six-course tasting menu (€45, or €85 with wine pairings) including Japanese-inspired shiso leaf tempura with salted mackerel and yuzu, and a delicious Peruvian ceviche-style dish of seabass tiradito. For something special, 180 Degrees (180degrees.ee) is a must for fine dining. It’s the newly-opened restaurant by Matthias Diether in Port Noblessner, a cool seaside area that’s undergoing lots of regeneration, with loft-style working spaces popping up here and there. The acclaimed chef has led restaurants to a Michelin star eight times and is now making a play for Estonia’s first with a sublime tasting menu that includes a delicious goose liver crème brûlée. A six-course tasting menu costs €92 and additional wine pairings cost €87. To kick it like a true local though, head to Moon (restoranmoon.ee) – but don’t be put off by the twee cafe-style decor and slightly shabby exterior. This is a true neighbourhood favourite dishing up Russian food with a Baltic twist; try elk dumplings (€10/£8.50) or beef tartare with smoked egg yolk (€13). A word of warning: The owners will also encourage you to do a shot of vodka* with every course, so trying to get through the menu without slurring your ‘terviseks’ (Estonian for ‘cheers’) is a challenge. A good brunch is never too far in Tallinn, and the fresh and aromatic small plates at Sfäär (sfaar.ee) are a safe bet (a dish with a glass of bubbly costs €26). It’s a cool, Scandi-inspired place with high ceilings, hanging ferns, potted succulents and ceramics you’ll wish you could cram in your suitcase. Ülo (info@ulo.ee), a vegetarian cafe across the street from the Baltic Station market, is another new lunch spot that’s gaining attention for its experimental flavour pairings, like wasabi falafel and seaweed watermelon (part of a snack sharing selection, €10.70 ) and kimchi sweet potato fries (€5.50). Order a glass of the delicious rhubarb sparkling wine to wash it all down with – it’s made in Estonia where the climate is perfect for growing the fleshy vegetable. Kaja Pizza Kook (kajapizza.ee) is another completely off-the-beaten track local find in the heart of suburbia. It has a small wood-fired pizzeria used by chef Andrei Lesment to make 100 pizzas every day. That’s it. Nothing more. Lesment cut his teeth at The Savoy and Gordon Ramsey’s Maze, before opening Verru in Marylebone. He then packed it all in for a change of pace at this completely under-the-radar pizzeria. A pizza will set you back just €7, and much like the rest of Tallinn’s food scene, it’s bonkers but brilliant. For more information, go to visitestonia.com.